Location Location Location! Welcome to the Okefenokee Country Club and 1444 S. River Oaks Drive. This home is over-the-top with features and has an incredible view of the golf course. There is an in-ground swimming pool and detached garage with bonus room above. The home has 2 master suites, one upstairs and one down below. There are too many details to list. You have to see it for yourself to appreciate all the extras that come with this home! DIRECTIONS: Traveling north on HWY 84 from Waycross, turn left onto GOLF CLUB ROAD. Turn left into the Okefenokee Country Club main entrance, and make a left onto S. River Oaks drive. The home will be down on the right. Sign in front yard. It's a large home with white vinyl siding. 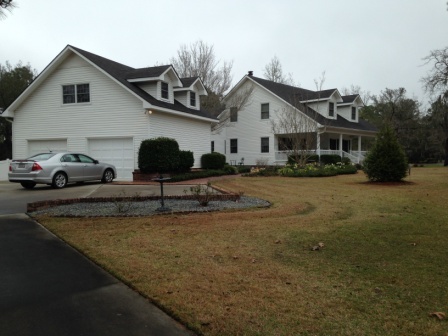 This home is convenient to Waycross and Blackshear and has A LOT to offer. Come check it out today!